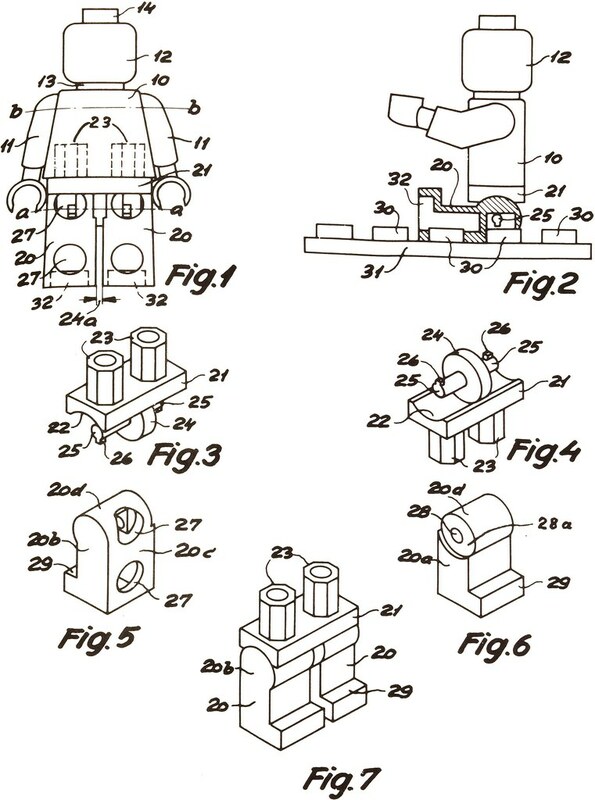 To celebrate the occasion LEGO has issued some fun facts and dozens of interesting images of prototypes, patent diagrams and so on. We've reproduced some of them below. LEGO has chosen to celebrate the minifig's birthday on what seems to be a rather arbitrary date: "August 29th has been chosen as this was the original date that the first patent was filed in Denmark, in 1977. 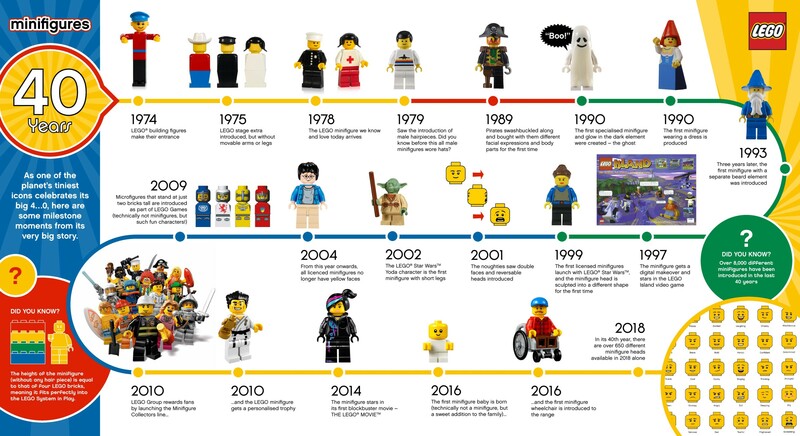 The first minifigures were not launched until 1978, hence we are celebrating the 40th anniversary of the first launched minifigures and not when the first patent was filed." Confused? I certainly am! Here's the diagram, cleaned up a bit. 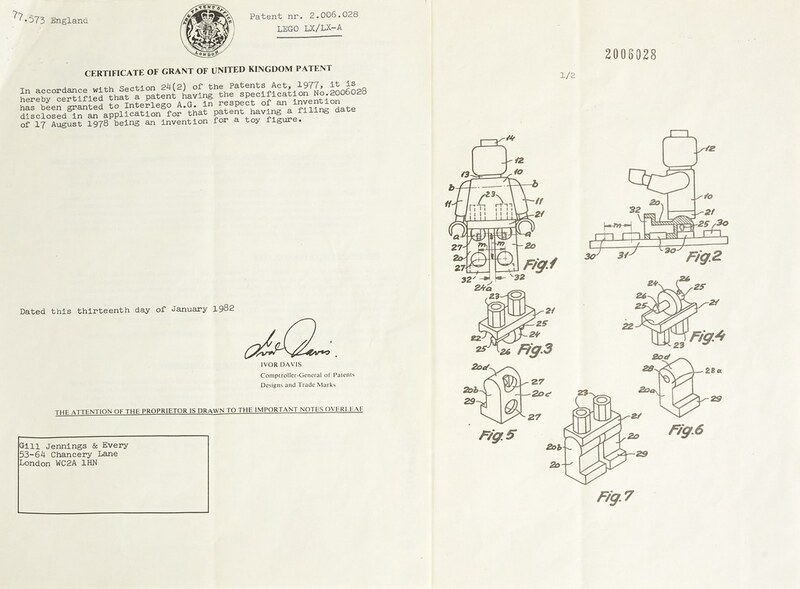 A PDF copy of the full US patent can be downloaded, which describes the numbered aspects of the design. So, as one of the planet’s tiniest icons celebrates its big 4…0, here are some milestone moments from its very big story. And if you’re worried about our robotic friends, don’t be. There have been plenty of C-3POs and R2D2s (not to mention other robots) too. 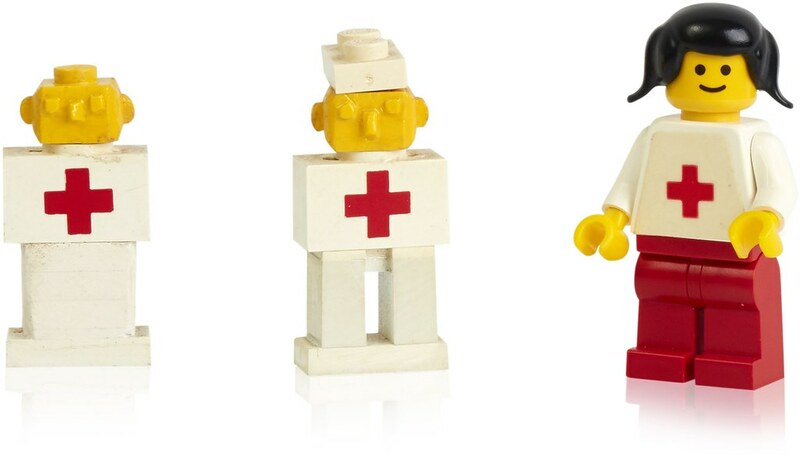 LEGO minifigures may be made for fun but there’s a serious side to them as well. By offering an endless choice of roleplay possibilities, they’re designed to let children play inventively, engage with different emotions and tell their own stories. First and foremost, that means a whole lot of enjoyment. But, crucially, it also allows young people to develop key life skills like emotional intelligence, creativity and communication – skills that, according to new research for the LEGO Play Well Report, parents believe will be vital to helping their children build their own bright future. Thank goodness we didn't end up with the middle one! There's loads more to come. Check back later! Would love to see someone stack 20,000 minifigs on top of one another without any support. My best is 15. I don't think it's possible though without some kragle. Edit-those early heads remind me of robots for some reason. Those prototypes look like they were made by hand. They look terrible today, but to think these are 40+ years old... yeesh. It's amazing those designs became something so long-lived, beloved and iconic. Happy birthday, minifigs, you amazing little fellows. Awesome stats! I love a good few numbers occasionally. "And if you’re worried about our robotic friends, don’t be. There have been plenty of C-3POs and R2D2s (not to mention other robots) too." They neglect to mention no L3, the mistress of robotic diversity (just in case you didn't notice from the subtle hints in the film). Still, there's hope for a custom mould yet! The new (novelty) elements, particularly for minifigs, are still handmade today from rubbery materials and clay - it's what they use as a base before using the dimensions to build or scan a more accurate mould, usually scaling it down from an enlarged version. Like the designs of the sets themselves it all starts by hand and just getting stuck in! So for the Star Wars 40th Anniversary they will be making 20,000 gold chrome C-3POs...right? ^ That ship has sailed, unless you're talking about the 'Lego' Star Wars 40th anniversary of 2039. Got to wait a little for that one. It's also interesting to see such a stereotypically British helmet on the police prototype figure. I remember when they came out. I was 12 years old at the time, and near the end of my LEGO playing days. But I had a few sets with minifigures. ( some of them are probably my brothers) I had switched to technic the year before. I had more of the earlier type of minifigure. I think the one prototype looks like Homers Simpsons dad. On a related note, according to my Brickset database I owned 3338 unique minifigures. Will need another 600++ unique minifigures to reach just the half-way point! While it was a good 20 years before I was born, I’ve had the wonderful privilege of getting to build many of the earlier sets with the Minifigures. I will never forget the feeling of building these amazing sets with the amazing Minifigures. I also got to experience the Minifigures when they were 10 years older and all the way up to today’s Minifigures. Each one has brought something unique to the LEGO world. "whatever role, character or personality children fancy playing, there’s sure to be a minifigure to match." Except a modern soldier or fighter pilot. Look at that policeman, now we know the true origin of the Scribble-face Bad Cop. The 1975 style drives me back to my very first builds and hours playing... I do remember quite well that cowboy ranch, red and black, with a watch tower, and those non articulated minifigs which could nonetheless sit on a fence or ride their horse... It was magical. And a few years later came the yellow castle, and it's knights and soldiers. And my childhood changed the day I was offered it. I plunged into Lego. Happy birthday to the Lego minifig, with so many memories of hours and hours of building and playing adventures. Loving the more rounded prototype space helmet. Realized that I own that firecar, policecar and ambulancecar. The other versions of the minifigure look like robots maybe an idea to include them in a anniversary set? The Lego Minifigure is one of the most important milestones within Lego History. Happy Birthday! Some of those prototypes . . . I'm sure you can buy 'em in Wilko's or The Works. I'm surprised their timeline doesn't mention the point in the 1990s when the face changed from the standard smile to the variety of custom faces. Is it a reasonable excuse to buy myself some MISB from the 1980's? What is the current global minifig population? I can only assume Lego will make us aware when minifigs out number humans. for the 40th Instead of 5005358 they should have released some of the prototypes just for fun. @PDelaHanty; check the timeline @ the Pirate - 1989. I’d love to see the Star Wars prototypes! Happy birthday Minifigure! Here's to 40 more years! Weird that the first Star Wars fig was Padme. You think they'd use someone from set 7101 or Jar Jar given the context of the comment. Hey, I share the same birthday as the minifigure! Happy birthday to our minifigures. That figure depicting the parts of the figure with numbers is really satisfying for me as a mechanical engineer. So what we sometimes call 'proto-figures' (the ones from 1975-1977) were officially called 'LEGO Stage Extra Figures'? I wonder if that's just something they made up retrospectively when the 'real' minifigures arrived, but if so, for what purpose? @PrivateMatrix, I can only hope you're joking. If you think them making soldiers and military figures is a good idea, you're incredibly ignorant. @Atuin: I distinctly remember when the modern mini-figures came out in 1978, there were still a few sets available with the original figures with non-moving legs and arms and blank heads. The USA Lego catalogues at the time called those minifigures, and the new modern ones with moving legs and arms and smiley-faces were called "mini-action-figures". @monkyby87: Why do you think @PrivateMatrix could be joking? He is completely correct. I am no big fan of the armed forces, but for LEGO to neglect that aspect in their City line is hypocritical to the max. Because they have no problem producing millions of soldiers, weapons and fight scenes in the Star Wars sets. And don't tell me that's different because it's fictional. Look at the slaughter scene at the beginning of TFA. If such a scenario fits in LEGO's "family friendly" policy, then why not normal sets with soldiers. so, I recently noticed a change in the minifigure head. there used to be three holes in the stud on top of it, I assumed it was for safety reason in case a child swallowed it (then air could still pass through) but nowadays, while the stud is still hollow (as opposed to the very early ones) the holes have been filled. Anyone knows the reason behind the change ? Whoa! I turned 40 yesterday! According to Lego's reasoning, minifigures and I are the exact same age! @AustinPowers: It IS different because it's fictional. The armies from themes like Star Wars and Lord of the Rings haven't actively killed people in the real world. Real militaries have. And regardless of when/if you consider military action to be justified, it makes no sense for Lego to depict weapons, uniforms and military vehicles that have been involved in conflicts in living memory—not when their audience is so global. Any such depiction that might be perceived as patriotic or aspirational in one market is liable to be considered insensitive or even traumatic for another. Even the Lego City Police you mention appear unarmed, to avoid touching on the grim realities of police violence in the modern era. That's a trick that doesn't work with military sets—remove the violence and you've removed their very reason for existing. The first version had a standard solid stud with the word LEGO on it just as on a standard 2x4 brick for example. It was introduced in 1975 when the first figures appeared in what was formerly known as the 'Mini Wheelers' theme (the direct precursor to classic Legoland Town (1978-1990). If you look closely enough you will also notice that the rounding at the 'chin' (in lack of a better word) had a slightly smaller radius than the next version, making it look more cylindrical than spherical. These were only ever available (at least in sets) in yellow, black, red and transparent. The second version was introduced somewhat at around the end of 1991 with a transition phase up until mid 1992, were both variants could be found in sets. This is the one you mentioned with the 3 holes, having 3 little lines coming from the center at a 120° angle respectively. You are right that such designs are usually applied as a safety measure, that should still allow breathing when the part is swallowed. The third version (the current one) appeared around 2012, with almost all 2013 heads and later having this stud type that is identical to the one on technic hole bricks for example. I have not yet noticed any other difference between the two. The old stud type with the triple hole is interestingly found on a few other parts, like the 'glass case' (30151) and most noticeably R2-D2's head. R2's head shares the similitary that it is a round object with a print on it, like the minifig head. I have a feeling that this geometry helped in alignment for the printing process (though not sure of cause). It is also suspicious that when the triple hole was introduced, it was the first year that all minifigure themes shifted away from the standard grin to more complex designs (only Pirates did it before). Maybe the felt a need for added control at the time? Now with more advanced printing technology this was no longer necessary and when the old mould needed to be replaced they changed it to a more typical stud where the letters 'LEGO' could be applied (I heard they are very sensitive about this type of brand identity)? "when the old mould needed to be replaced they changed it to a more typical stud where the letters 'LEGO' could be applied (I heard they are very sensitive about this type of brand identity)?" That's the most likely reason: to be able to apply the LEGO branding to minifig heads and protect the minifig.